Being healthy does not mean losing all the fun of eating delicious dessert. Many healthy restaurants offer delicious cakes which are packed with nutrition while minimizing the use of high-gluten flour, egg, and animal-based ingredients. Vegan cake can be as luscious as the fatty one if it is made with high-quality ingredients and baked properly. This kind of food can be easily found at some cafes in Ubud, Bali. However, healthy cafés and restaurants start to flourish in Jakarta with its rush and high-stress level. People begin to be more conscious about their body and mind which leads to a healthier diet. When you really fall in love with a slice of healthy cake and begin to wonder about how the cake can be as delicious as the unhealthy one, it is actually not very hard to make. Vegan baking also does not need high-technology equipment and precise measurement to make. Yoesi Ariyani, a healthy food practitioner, became a vegan three years ago and said that she felt a dramatic change in her body since that time. However, being a vegan does not stop this mother-of-two to make scrumptious dessert. “The key is using the right substitute ingredients,” said Yoesi in her cooking demo at Pasar Ragam, Songolas (12/12). For example, egg can be substituted with the mixture of flax seed meal and warm water. Gluten-free flour is now easier to find on healthy stores as well. Yoesi also said that a vegan should have more awareness when choosing right ingredients. Instead of using cocoa powder, Yoesi uses cacao powder that does not involve the using of milk and animal protein in the making. “Local ingredients using is also encouraged as sometimes we don’t see how precious they are. One of the examples is moringa. We have it in abundant number in our country but it is actually rare and priced very high in other countries,” said Yoesi who described moringa to have almost same flavour as matcha but is much healthier. Vegan and healthy dessert can be an alternative for you and your family to stay healthy in this holiday. Chocolate cake and ice cream; how could we resist the temptation? 1. Preheat oven to 350°F or 177°C. 2. Flax egg: whisk warm water and flax seed meal in a small bowl and let it sit for a while. 3. Basil sugar: combine basil and coconut sugar in a food processor and blend until forms a fine paste. 4. In another bowl, combine coconut oil, vanilla extract, and basil sugar. 5. Stir in the flax egg. 6. Stir in the zucchini. 7. Add almond flour, cacao powder, sea salt, baking soda, and chopped dark chocolate. 9. Pour mixture into a prepared muffin pan. 10. Bake for 30 minutes or the toothpick comes out clean. 11. Let it cool on a wire rack. 12. 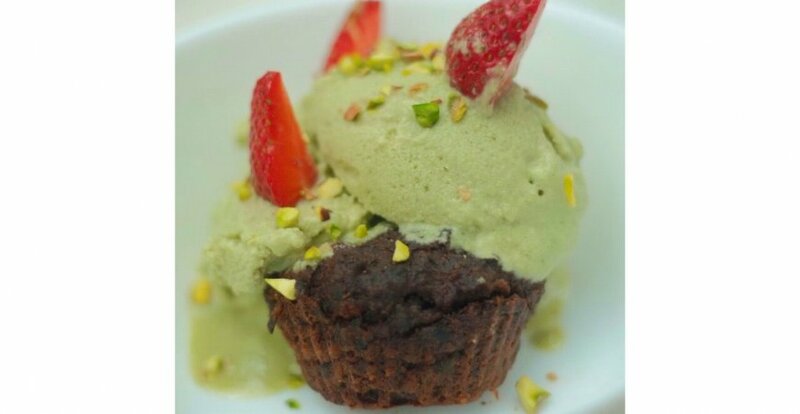 Serve with Moringa Ice Cream. 1. Add coconut milk, coconut meat, cashew, coconut sugar, moringa powder, and irish mosh to a blender (high-speed blender is preferred). 2. Blend until smooth and well-combined. 3. Adjust the flavour. Add more sweetener if you prefer. 4. Pour the mixture into an ice cream maker and process until it is done.